The IAQM is consulting members on its new Guide to the assessment of air quality impacts on designated nature conservation sites (pdf). 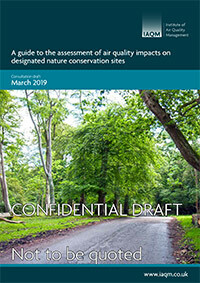 The document has been produced to assist members in the assessment of the air quality impacts of development on designated nature conservation sites. It may also be useful for ecologists, who use the results of air quality assessments (AQAs) to evaluate the effects of air pollution on habitats and species, by increasing their understanding of the information provided by air quality specialists. We are asking members to comment on whether the Guide would work for you in the assessment of impact. Comments should be restricted to the clarity and purposes of the document. We are aware that some figures need to be redrawn and a small number of stylistic changes are required, but these will be picked up in the final version. The consultation period will be for five weeks and will close at Noon on Tuesday 30th April. Please send your comments before that date to guidance@iaqm.co.uk.